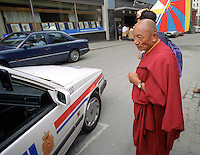 On Thursday June 27 1996 the Norwegian police basically revoked free speach and the right to protest, as they attempted to sheild Chinese president Jiang Zemin against any opposition voices during his visit to Oslo at the end of June 1996. People wearing yellow T-shirts with the Chinese characters "Human Rights" and weaving Tibetan flags were kept far away from president Jiang Zemin and his entourage of armed Chinese security personnel. The protesters were few and peaceful, yet Norwegian police detained several activists, others were chased away. There was scathing editorial criticism of the police silencing of all demonstrations in Oslo during Chinese president Jiang Zemin's official visit. Minister of Justice Ms. Grete Faremo stated at a press conference that the right to demonstrate is fundamental and cannot be overruled, thus severely criticizing Oslo Chief of Police, Ms. Ingelin Killengreen. Prime Minister, Ms. Gro Harlem Brundtland also stated yesterday that she was "far from happy" at the deployment of police to shield China's president from seeing demonstrators. Later, Chief of Police apologized to Palden Gyatso, the 65 year old monk who escaped from Tibet after spending 33 years in jail, for the police action against him. Both Faremo and Killingreen have since been criticised for their leadership in relation to the 2011 terror attack in Norway, and the many failings of the police and politcians.